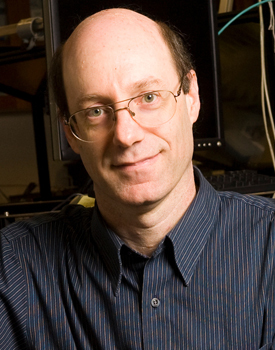 David Smith has been named chair of Duke’s Department of Electrical and Computer Engineering, effective August 1, 2014. Smith, the James B. Duke Professor of Electrical and Computer Engineering (ECE), is one of the most highly cited and highly respected scholars in electrical and computer engineering worldwide. His leadership experience includes serving as the director of Duke’s Center for Metamaterials and Integrated Plasmonics (CMIP), a strategic advisor for Kymeta Corporation, founding and continuing strategic director of the Metamaterials Commercialization Center at Intellectual Ventures, and a former director of graduate studies for ECE. He succeeds Larry Carin, who became Duke’s vice provost for research on July 1. Lisa Huettel, who is acting chair until August 1, will continue as associate chair under Smith. Smith will also continue to serve as director of CMIP. “I am grateful to David for his willingness to step up and take on the leadership of the department, and excited about his ideas for building on the momentum generated in recent years,” said Pratt School of Engineering Dean Tom Katsouleas. “He is widely admired in ECE for his scholarship and thought leadership. These and his caring approach have engendered strong support from faculty and staff alike. In my conversations with him, it became clear that no one cares more about the department and seeing every single person in it thrive and reach their fullest potential. Smith joined Duke in 2004, and holds a professorship in physics as well as ECE at the university. He is also visiting professor of physics at Imperial College, London, an affiliate professor of electrical and computer engineering and the University of Washington, and an adjunct professor in physics at the University of California-San Diego, where he earned his PhD in physics in 1994. He is widely known for his research in the theory, simulation and characterization of unique electromagnetic structures, including photonic crystals and metamaterials. Smith has been at the forefront in developing numerical methods to design and characterize metamaterials, and conducted key experiments that have illustrated their potential—including the first demonstration of a metamaterial with negative refractive index in 2000, and the first “invisibility cloak” in 2006, co-authored with ECE professor Steve Cummer. He is co-inventor on more than fifty patent filings and fourteen issued patents relating to plasmonics and metamaterials and has received numerous honors for his work, including most recently the American Physical Society’s McGroddy Prize for New Materials.